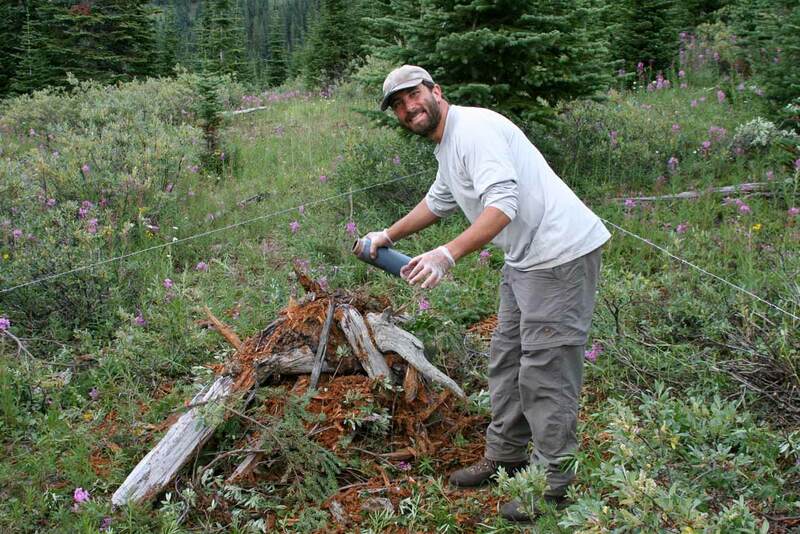 Dr. Michael Sawaya about to pour blood and guts over a pile of wood inside a maze of barbed wire. This "hair trap" is effective when collecting samples for genetic testing. Not far from the Trans-Canada Highway in Banff National Park, Dr. Mike Sawaya, a researcher with Parks Canada, ran into five grizzly bears while setting a trap to collect grizzly and black bear hair. The trap was strategically placed in a buffalo berry patch, a favourite bear food, and used rotting cattle blood and fish guts surrounded by barbed wire to painlessly snare bear hair for genetic testing. Sawaya, who was both excited to see so many bears, and aware the rotting lure he was carrying made him smell like bear food, kept his pepper spray out, and made a heck of a lot of noise. 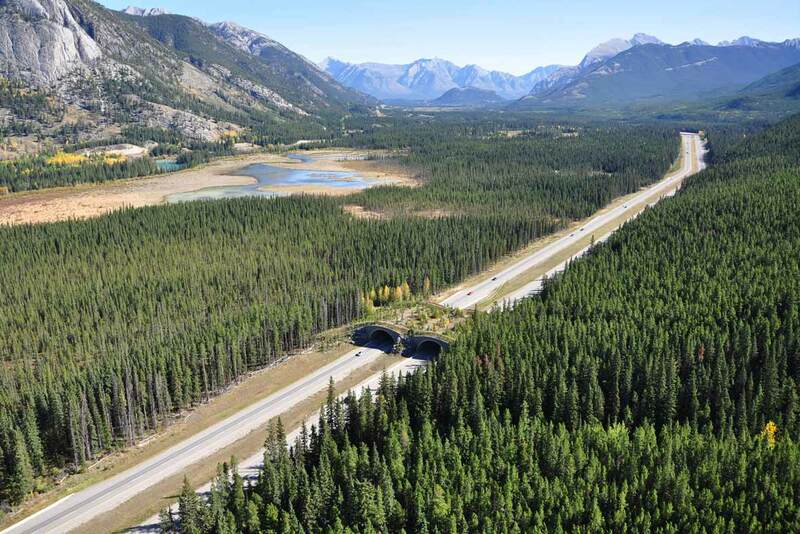 Since 2006, Sawaya has studied the effectiveness of wildlife underpasses and overpasses across the Trans-Canada Highway in Banff National Park. The four-lane, fenced-in transport route has been seen as a barrier to wildlife movement since its completion in 1962. For this reason (and to prevent animal-vehicle collisions) two wildlife overpasses and 23 underpasses were built in the 1980s and 1990s. Several more have been built since. But are they working? According to Sawaya, the answer is yes. In a study published in February, Sawaya used an analysis of DNA obtained from his bear-hair samples to show the first evidence that wildlife crossings promote gene flow across the highway: they're helping bears cross over to find mates on the other side. Having breeding opportunities on both sides of the highway is important in preventing inbreeding, which can result in genetic abnormalities, reduced fertility and less resistance to diseases. For Sawaya, what he is able to learn from bear hair is clearly worth the risk of running into a bunch of grizzlies. “One of the unique things the work with DNA can do is tell us the sexes of individuals, their relatedness and their parentage,” says Sawaya, who has also used DNA analysis to examine how individual bears use the wildlife crossings. For example, based on research he published last year, he was able to determine that grizzly bears were much more prone to use the overpasses. "And if you break it out between males and females, pretty much all the female movement was on the overpasses,” he adds. This is important information for wildlife managers when considering the placement of overpasses in the future. The study also showed that although the crossings are beneficial for grizzly and black bears, each species uses them in different ways, and to different degrees. 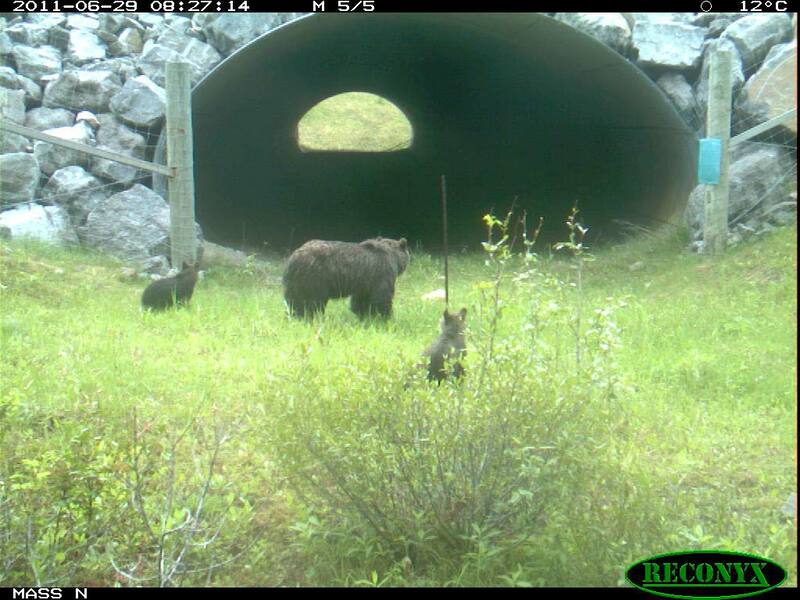 “There was such a big difference between black bears and grizzlies in terms of their preference and willingness to using different crossing structures,” says Sawaya, who found it especially striking that grizzly bears showed a preference for overpasses given the fact that underpasses are considerably more numerous and available. Black bears, on the other hand, have a preference for underpasses, and use them to cross the Trans-Canada Highway frequently. “It’s pretty widely accepted that black bears and grizzly bears have different behaviour in terms of their responses to humans and human development,” says Sawaya, adding that black bears are more tolerant of humans and human infrastructure, whereas grizzly bears are more easily deterred by highway noise and man-made structures. This behavioural difference may also explain the differences seen between the two species in terms of genetic exchange across the highway. The more confident black bears also seem to be more successful cross-highway breeders: their gene population is healthier and similar to a population of bears whose habitat has not been fragmented. The more skittish grizzlies are not faring as well. Still, Sawaya believes even this reduced exchange in grizzly bears allows adequate gene flow to prevent genetic isolation. According to Sawaya, these studies help put to rest the persistent myth that the crossings aren’t effective. Part of the reason this myth evolved is that it took years for bears, especially grizzlies, to learn to locate the structures and how to use them. So will Sawaya pack up his pepper spray and head out to collect hair again this spring? Right now, he’s safe inside, examining wolverine DNA to see what he can learn about how they use the crossing structures. However, he is clearly passionate about getting back to bears and deepening his understanding of how and why they cross the road ... and what happens after they do. Beyond the viral video: What happens after a grizzly bear encounter? Waggle-dancing bees: Ecological consultants of the future?